Nearly everyone uses computers, smartphones and tablets to manage not just their work lives, but their home and social lives, and so interacting with a user interface is the rule, not the exception. So it's hardly uncommon for an employee who's not a "techie" in the sense of being a developer to be able to sit down in front of a tool, navigate and figure out how to use it. The revolution we've experienced in user-friendly interfaces has made this even easier. Not too long ago when you were using a piece of software for work, you could expect clunky information architecture and a list of workarounds to get your job done. Now vendors build out their products with end-user ease in mind. But there's an irony there. As our office tools have gotten easier to use for simple tasks, they've also gotten drastically more powerful – and more complicated. If this sounds confusing, think about spreadsheets. If you've ever used a spreadsheet to log a few simple figures then watched a power user dig into the developer tools, utilizing Visual Basic and advanced macros, you realize that there's a difference between using and really using a product. The latter isn't something that you can just feel your way through. In today's workplace, many pieces of cloud-based enterprise software are like that. Underneath the pretty user interface, there is a host of robust, advanced features. They're not the sort of thing a novice user – or even an intermediate one – can just stumble through; but they're where the real action happens. And this is something that some of the best vendors out there have begun to recognize. You've probably noticed training and even certifications available to power-users for big-name applications. Training works; we’ve seen it firsthand at SpringCM. 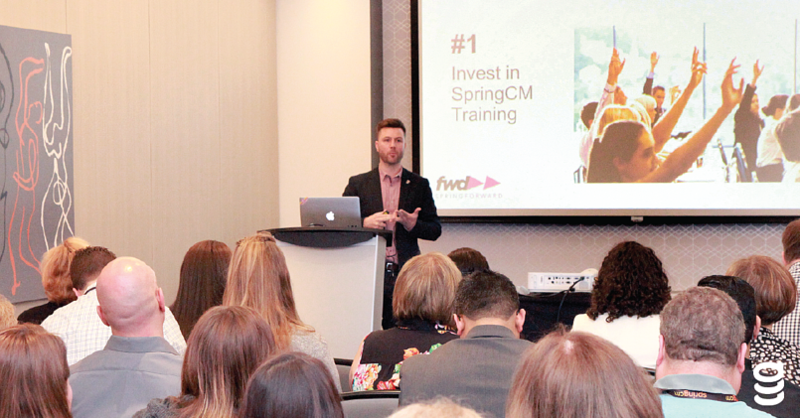 So let's take a peek inside our training program, SpringCM Academy, to see why it's been such a success, and why it's worth it for every SpringCM Administrator, Business User, Business Analyst, Developer, and Partner to explore. As we've discussed, having skills that can get you through the basic functionality of a tool might get you somewhere – but a great deal of the value SpringCM offers is in the tools that aren't so obvious. Important elements of the SpringCM experience, like setting up complex workflows to streamline document approval processes, rely on a quite intimate knowledge of the tool. By training users on these types of things, we enable them to use the platform to its fullest potential. Training results in an improved user experience – meaning once someone has been trained, they can do their job more effectively. But it's also much more than that. If a user knows how to take advantage of all the capabilities SpringCM offers, the business gets more value out of the tool. And Administrators, Business Users, Business Analysts, and Developers knowing how to take full advantage of the tool means they can make a business's contract and document process run more smoothly. By using the full capabilities of SpringCM, the tool streamlines and automates business processes by promoting a more cost-effective approach with improved operational efficiency. It also creates a synergy between our customers’ SpringCM administrators and our in-house support team. When everybody is on the same page about what the features are and how to use them, they're really speaking the same language. So when administrators contact SpringCM for support, there's no confusion. When administrators suggest new features and enhancements, there's no doubt about what they mean. So training doesn't just make SpringCM a more effective tool for our customers – it makes us work better as well. Even the most skilled, self-taught user of a platform can learn something new from training – and a lot of the feedback that we've gotten on our training offerings reflects that. Administrators who are already making good use of the platform have been able to supercharge their SpringCM experience. And our in-person training opens up new landscapes of learning and networking for everyone involved. Participants learn not just from our experts, but from the questions asked by their fellow administrators from other companies. And our experts learn from the questions our trainees ask. So, SpringCM's broad and diverse user base benefits from the interactive community our training creates. One potential sticking point of platform-specific training is that people don't always have a great deal of time to dedicate to getting skills on a particular piece of software up to snuff when they're juggling the myriad demands, challenges and tasks of today's office environments. So with SpringCM training, we do everything possible to allow administrators to work the curriculum into their schedules. For some, face-time with experts is the best way to learn – and that's why we offer our instructor-led courses, which put you the administrator in a classroom for a few days (depending on the course) of intensive hands-on instruction. Administrators attending learn both from the instructors and from the other eager and excited SpringCM administrators who have come to explore the ins and outs of the solution in an immersive learning environment. For those without the time to take off for an in-person boot camp experience, but who still want a directed learning experience, SpringCM offers virtual courses. Our online classrooms provide the same individualized instruction of our in-person training – with the added convenience of being able to do them from your own office or conference room. Some people just learn best on their own. So for those self-directed administrators who've already gone the extra mile figuring things out, but still have questions about what SpringCM can really do, we have our self-paced courses. This option makes it easy for administrators to get educated on – and inspired by – SpringCM's exciting roster of features on their own time. With monthly training offered on foundational skills (SpringCM Essentials) and higher-level technical ones (Process Automation and Process Automation with Salesforce), we're always working hard to assure that administrators at every skill level are set up to make the most out of SpringCM. And as we’re always focused on offering our customers more and better experiences, we’ve got plenty more on the horizon. As our educational resources and methods of delivering training continue to grow, we've got more courses, more self-paced material and even official accreditations for power-users in the offing. Your success is our success. So explore the SpringCM Academy, let us help you build your skills – and continue together with us on the path to seamless contracting processes and operational efficiency.